TRAINERS AND COACHES: ARE YOU READY TO CHANGE THE COURSE OF YOUR FITNESS CAREER? Join me and fellow fitness rebels as I walk you through what it takes to start up and launch a profitable outdoor fitness business. PURSUIT is an on the go, hybrid HIIT workout that occurs THROUGHOUT your park and city, utilizing every obstacle that crosses your path. 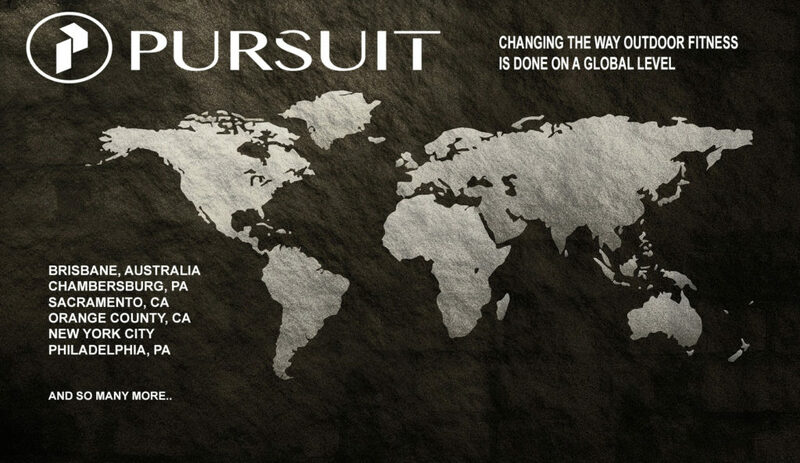 PURSUIT is outdoor fitness 2.0. Hi I’m Dr. Laura Miranda, founder and creator of PURSUIT. I want to teach you everything you need to know to change the bodies and lives of MORE people in your town, and do it with a revolutionary fitness movement that NO ONE has ever seen before. But for the first time ever, for 2 days in May I am hosting a SMALL group of fit pros in NYC and teaching you every last PURSUIT trade secret that has helped change the course of the careers of trainers just like you, all across the globe. This is for those action taker, badass, rebel coach who want a direct, step-by-step plan on how to create and launch a successful fitness business that gives you more freedom, more money in less time, and a solid future beyond training clients 1on1. Expect to take everything you learn and plug it directly into YOUR specific business, on the Monday morning you get back home. to become powerful leaders themselves. ⇒ This is NOT for those who want to sit on their knowledge and not take any action. ⇒ This is NOT for those who want yet another cert under their belt that never generates any more money. ⇒ It’s NOT for those trainers who are comfortable following along with the “fitness status quo” and are OK with continuing to drudge down the same path like every other trainer out there. ⇒ And, this DEFINITELY isn’t for those who aren’t FUN (and/or slightly nuts.) B/c I certainly am both; you are coming to MY city, and we are going to F things up together!! ARE YOU THIS KIND OF TRAINER? We can ALL get so caught up in the intra-industry arguing about the minutia of training that we forget what this is REALLY all about. What are you doing with your clients?! Getting them to lift 40 MORE pounds on the bench? Helping them hit a PR of 100 squats for time? Coaching for the best squat technique in the world? ARE YOU CHANGING THEIR LIFE? ARE YOU CHANGING their mindset patterns? Are you giving them a deeper connection to themselves? Are you giving them the tools to be in PURSUIT of becoming the best possible version of themselves? This is the PHILOSOPHY behind PURSUIT. THIS is what gets your clients RESULTS beyond just the workout and the fat loss. THIS is gets them into your class and KEEPS them there for the long term. It’s a call to all trainers and coaches who see fitness through different lens than most. And it’s the reason why I’m hosting this event ever live PURSUIT Coaches Weekend Intensive in NYC, May 19 & 20. You WILL leave this weekend with a completely changed mindset, a fire in your gut, and an actionable, simplified blueprint for success. 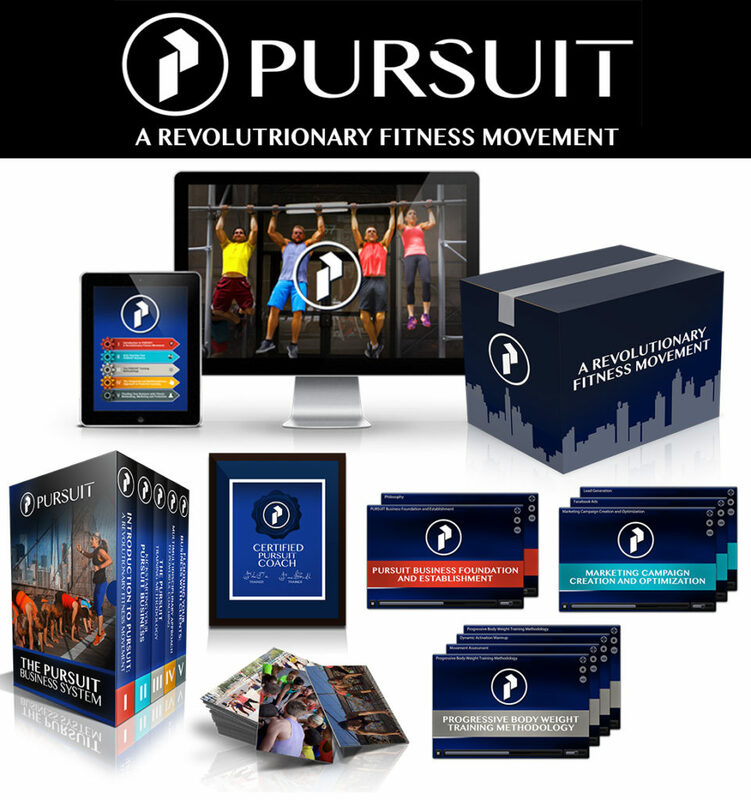 You will get all of the comprehensive course materials so you can start up and run a successful revolutionary fitness movement from day 1! The coaching, the training methodology, the done-for-you workouts, comprehensive client getting and marketing campaigns, and so much more. In addition to learning the revolutionary training method from me in person, we will be work-shopping your own PERSONALIZED marketing strategies, client attraction and retention campaigns, launches, websites, email marketing, adding additional $$ making services/revenue streams to your programs. You MUST passionate and hungry. You must be READY to change the course of your career with a brand new fitness concept that blows “boot camps in the park” out of the water! Don’t expect to just sit back, listen, and take notes for 2 days. You should be READY to make 2017 your most successful year yet! 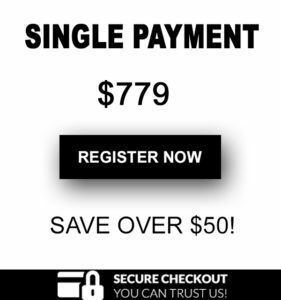 This entire program would cost you normally over $3000. But you’re not going to play anything close to that. NYC, lower Manhattan. Our meeting location will be hosted in my private office, and all over the EPIC infrastructure of gotham! MAY 19 & 20. 9-5 both days. We recommend staying downtown NYC, in Lower Manhattan. 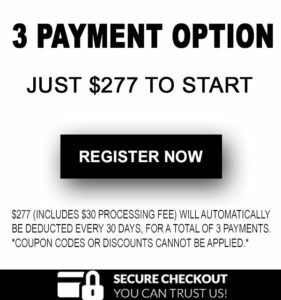 If by the end of the 1st day, you don’t feel that this event is worth every penny you invested, and you feel that when you apply what you learn that your business will NOT skyrocket in the months after leaving NYC, you will get every penny of your $ back. Have a question? Call me right now at 646.454.0777 and let’s chat! Or send me a message! I look forward to seeing you in NYC!